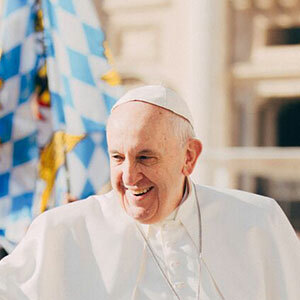 Elected in March 2013, Pope Francis has made it his mission to serve the poor and engage people from all walks of life in conversation about the Gospel message. In addition to countless homilies and letters, he has written two encyclicals (letters from the pope to all bishops of the Catholic Church) and 17 books. His works include The Joy of the Gospel, Praise Be to You, Men of Mercy, and The Joy of Love. Known as the “People’s Pope” for his humility, fight against inequality, and ability to meet contemporary social issues head-on, Pope Francis has made an incredible global impact. He has been called “the world’s most popular leader” by BBC News, and he ranked extremely high in popularity among Catholics and non-Catholics alike in studies conducted by the Pew Research Center, WIN/Gallup International, and other groups. Pope Francis continues to spread the faith in ways that resonate with people all over the world.